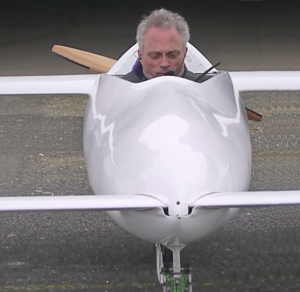 The CC01e, a tiny, single-seat canard design by Frenchman Claude Chudzik, flew for the first time in 30 years years, now powered by an Electravia-supplied motor system. Taking off from Nangis airport, team member Frederic Laude gingerly guided the airplane on its single circuit of the field. He reported some tendency to “marsouine,” or porpoise, of which he’d been forewarned, and managed to keep the pitch oscillations in check. Based on the team’s report on their blog, he accelerated to 60 knots (69 mph), pulled lightly on the stick and “jumped” off the runway. You can see the porpoise-like bobble immediately after lift-off, and Frederic’s ability to get things under control quickly. Once on track, he reached 94 knots (108 mph) in the pattern and managed a reasonable landing on the craft’s single-track landing gear. Originally flown with a 25-horsepower two-stroke engine, the aircraft has been reconfigured for a Lynch-type, 50-horsepower motor, controller and battery package supplied by Electravia. This will require a new language according to Frederic, since instead of pushing a throttle, he reports turning a knob to gain 250 Amps current draw for takeoff, and turning the knob back to zero for touchdown. The “Flying Electron” lives up to its name, presenting a petite visage with no room so far for even a GoPro to record the flights. One wonders where and how the retractable landing gear, batteries, and pilot’s toes manage to find accommodation. We look forward to more reports, since the team has ambitious expectations for speed from its newly-reanimated 30-year-old. I am curious about the wing area, wingspan, wing chord, and fuselage length.